Of course, the one time I am so besotted by my own cocktail invention that I vaingloriously choose to name the damn thing after myself -- the one time I do that, of course I encounter practically that exact cocktail not once but twice within the same week. Why, the chances of such a coincidence are nearly as preposterous as the obtuse grandeur with which I declare: TO HELL WITH ALL THE OTHERS, IT IS I WHO HAS INVENTED THE GREATEST COCKTAIL EVER THOUGHT UP BY MAN -- OR WOMAN, BUT ESPECIALLY MAN!! The PhoBlograpHusband and I have been traveling recently to such exotic destinations as Cincinnati, Pittsburgh and my parents' retirement bunker in Florida. While checking out Cincy's Findlay Market, I discovered Colonel De Gourmet Herbs & Spices. The Colonel De counter is a very happy place where you can sniff your way through dozens of spices, sugars and salts while totally geeking out and getting your foodie nerd on. Colonel De himself, with his beefy bratwurst of a mustache and gruff cheerfulness, is like Santa Claus, and his counter is like Candy Land. Colonel De used to work in IT (I think, something computers) and laughed when I asked him what the De was short for. We left Colonel De's with 11 baggies of granulated, crystallized and/or powdery wondrousness, mixtures like Jalapeno Citrus Salt, Coffee Shop Sugar, Garlic Rosemary Salt, Mint Julep Sugar and Lavender Confectioners' Sugar. That last one I had designs on for the rim of a martini glass, a la the World's Greatest Cosmopolitan. Jump to two weeks later, in Pittsburgh. I'm strolling the Strip, where you can buy Steelers paraphernalia, farmers' market produce or wackadoo foodie items like dog-biscuit biscotti. I am drawn into a Middle Eastern market by a sign advertising ouzo-flavored soda, and while there, I pick up orange blossom water and rose water, two ingredients I've been meaning to add to my cocktail cupboard, although I wasn't quite sure what I would do with them. 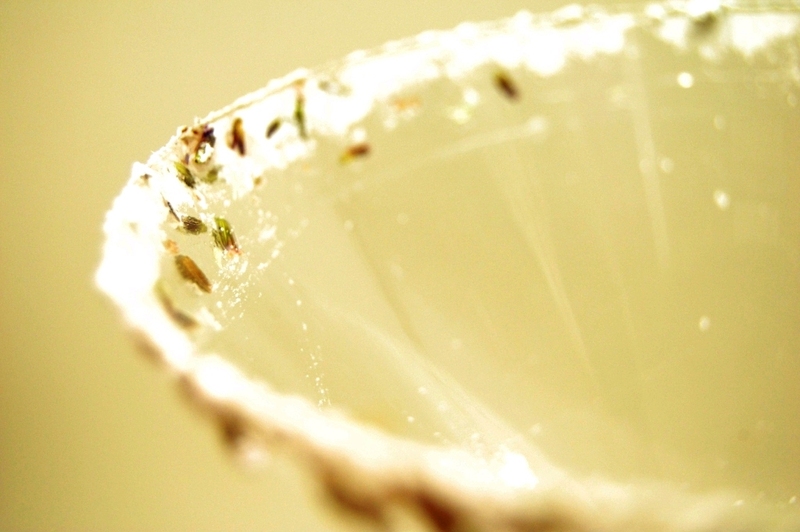 What I did was, I had folks over for one of our cocktail brainstorms, where I said to Mark, "I want to invent a drink that's got this lavender confectioners' sugar on the rim. I'm thinking rose water would play nicely, but I know it's pretty pungent and I don't want this to taste like you're drinking Grandma's perfume. What do you think?" One of us then threw out the idea of including St.-Germain elderflower liqueur. We kinda liked where this was going, but also realized that things may be getting too over-the-top in the floral department; we weren't trying to design a freaking wedding bouquet here. We readily agreed upon gin as a base liquor given how well it mixes with St.-Germain, and then somewhere along the way we came up with lemon juice as a zingy note that would cut through the botanicals. We mixed, we sipped, we liked... for the most part. What we had were four dynamic, flavor-forward liquids that tasted good together, but tasted a bit too... blaring. I thought what it needed was some mellowing and rounding out. I asked Mark, "What's your philosophy on raw egg in cocktails?" Mark said, "I'm not really into whole eggs, but egg whites, I'm totally down." 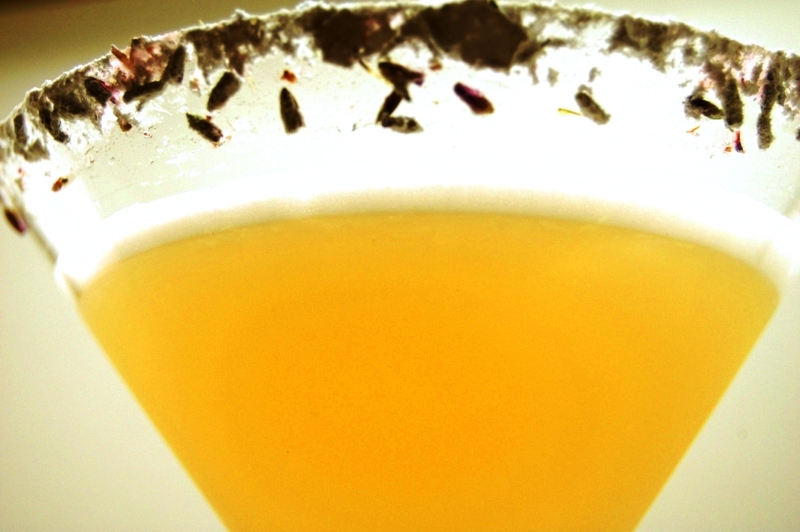 The Tea Rose Martini does right by using the earl grey's smoothness to temper down the other flavors. (I'll let you know what I think about the Socialite next time I'm in STL.) But still, folks, I gotta admit, this here Rose Is A Rose is Rose's best invention yet. 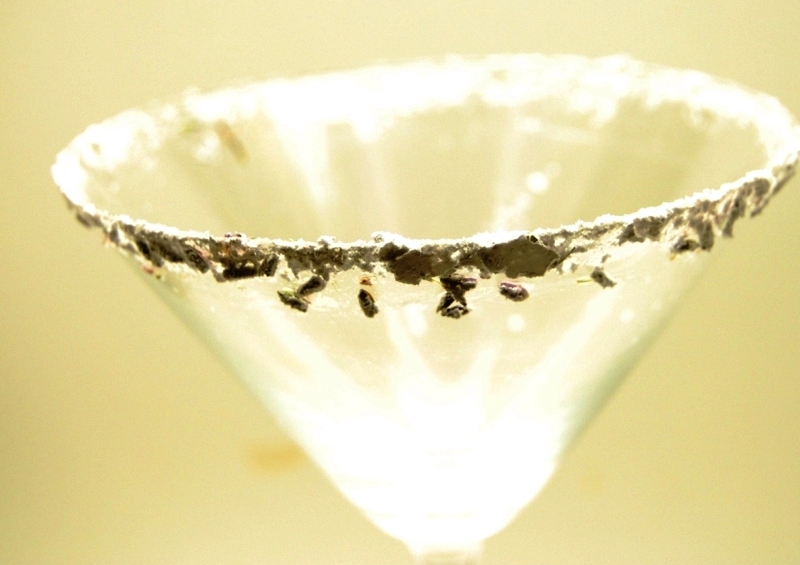 Rim a martini glass with lavender confectioners' sugar and set aside. 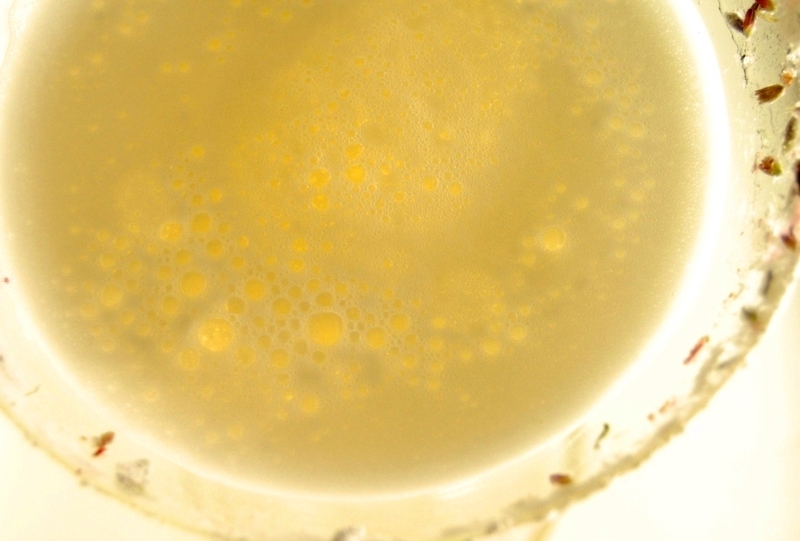 Combine all liquid ingredients, including egg white, in a martini shaker without ice and shake vigorously for about 20 seconds. Add lots of ice to the shaker and shake again. Strain into martini glass. Colonel De's lavender confectioner's sugar is basically just plain, old confectioner's sugar mixed with dried lavender buds. 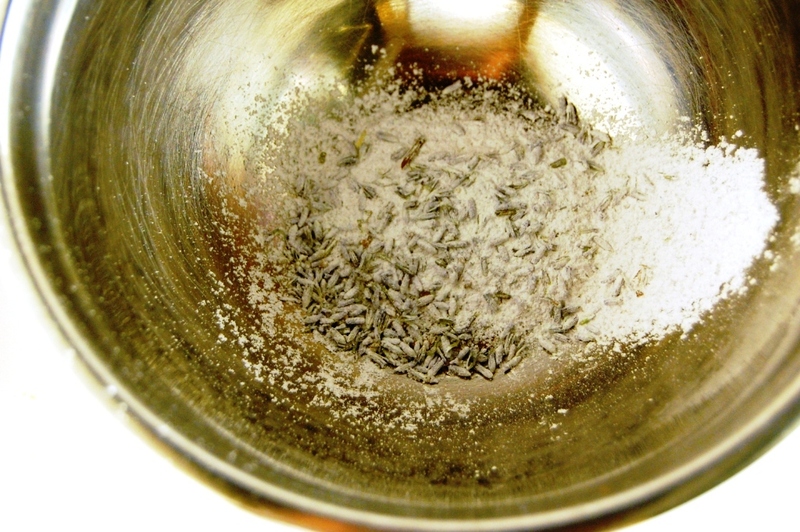 If you know where to buy dried lavender buds, it won't be hard to make. And I'd actually recommend pulverizing the buds further with the sugar using a mortar and pestle, which I didn't do.